To relieve sickness in the UK, but primarily the county of Suffolk and areas adjoining thereto by the use of Spiritual Healing, and to advance the education of the public in all aspects of Spiritual Healing. In our Constitution, we define 'spiritual healing' as "the beneficial effect which a healer has on a patient when, motivated by their own beliefs and following their normal practice, they adminster healing in contact through their hands or at a distance by thought transference or prayer"
it refers to a specific complementary therapy where a healer channels energy to a recipient to bring about a beneficial effect; the healer may be in contact with the recipient (laying-on-of-hands) or the healing may be carried out at a distance (absent or distant healing). it is also a global name for all energy therapies, sometimes called psychic therapies or psychic healing, where healers channel energy to recipients either in contact or at a distance. Therapies such as Reiki, LeShan Healing and Therapeutic Touch all come under the 'Spiritual Healing' banner. The Suffolk Healers definition of 'Spiritual Healing', see above, is a global definition thus it encompasses all healing therapies where energy is channeled to a recipient either in contact or at a distance. However, in practice, we limit our membership to those who practice, or wish to train in, two specific therapies: Spiritual Healing and Reiki Healing. Neither Spiritual Healing nor Reiki Healing are related to Faith Healing; neither depend on the beliefs of healer or patient to work; they both work equally well on plants and animals, neither of which are known for their faith or suggestibility. Suffolk Healers Association originated in Suffolk, England and our membership is concentrated in the East Anglia region of England (Cambs, Essex, Norfolk, Northants and Suffolk); within these counties, the majority of our members are in towns such as Peterborough, Colchester, Thetford and Bury St Edmunds. However, we do have members all over the UK and a few in other parts of the Eu. Most of our members are willing to undertake distant (absent) healing and Suffolk Healers does operate a distant-healing network (Circles of Light). Most of our members are also willing to travel reasonable distances to administer contact healing (contact us for information on healers in your area). 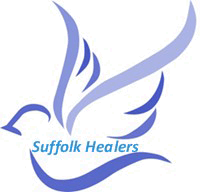 Suffolk Healers also provides training courses (Reiki and Spiritual Healing) and holds workshops on other healing-related therapies. Suffolk Healers is run by a voluntary Trustee Committee who meet several times a year to discuss healing topics, maintain the Association and implement change as required. Our Distant Healing Network (Circles of Light) was formed to help people diagnosed with life-threatening problems. The basic idea is that a network, or circle, of healers sends healing to those in need. Information, about a person needing healing, is given to the Circles co-ordinator and he/she ensures that the information is passed to a circle of healers. Each healer in the circle then sends healing to the person who is thus the recipient of a powerful wave of healing love initiated by several healers. Many have benefitted from the healing love generated by these circles and many healers consider distant, or absent, healing to be just as effective as actual contact-healing. Certainly we have received numerous testimonials from people who have been helped in this way. Please contact us if you are interested in training as a healer, in becoming a 'Friend of Suffolk Healers', or would just like some further information on the work we do.